World of Business Ideas, WOBI for short, is an exciting multi-media platform brimming with relevant and actionable management content in multiple languages that’s open to anyone for free. Created by HSM (producers of the World Business Forum) in collaboration with dotSUB, WOBI is a new gathering place—a global community of thinkers and doers—for leaders who put innovative ideas into action every day and change the world. WOBI will have hundreds of videos, blogs, documentaries, articles and apps—that are easier to discover, more accessible and internationally understandable—all focused on providing the inspiration, insights and best practices you need to comprehend the world and transform it. The world’s most innovative, influential and inspirational thinkers and leaders will be found on WOBI shaping their ideas and spreading their influence around the globe without geographical boundaries, without hierarchies, without limits. For more than 20 years HSM has been selecting, producing and distributing the best business content across many platforms: world-class events, print media, even a 24-hour TV channel; now WOBI unifies these diverse channels into one. dotSUB‘s mission is eliminating language barriers to human communications, so we’re making WOBI’s videos more accessible with subtitles in many languages, and we’re delighted about our partnership with HSM and the launch of WOBI. 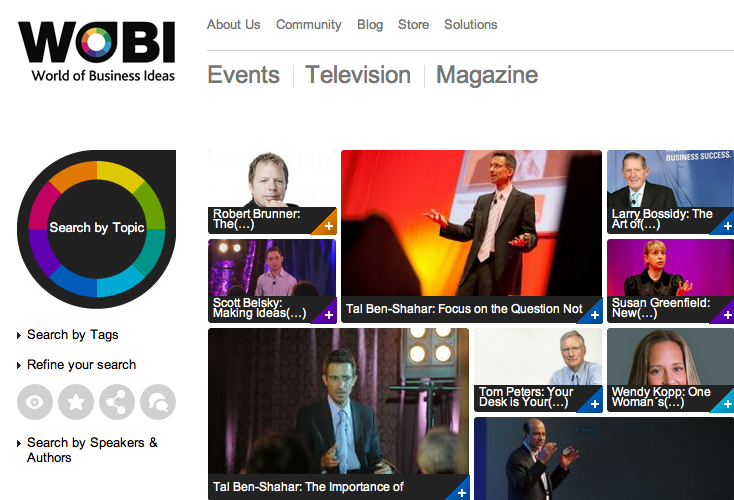 So please come, check out WOBI‘s new world-class content—in any language!